I am not a kid person. When someone that has a baby assumes that since I have kids I must love all babies, then hands me their tiny infant, I cringe. Don't get me wrong I don't hate kids, I just don't go crazy over every one that I see. I never have. Growing up I never wanted kids, the thought of raising tiny humans was never something that made sense to me. I hated babysitting, it was horrible and babysitting boys was the worst. They destroyed things, they never sat still and honestly I always thought I should be paid more to deal with them. As an adult I still don't enjoy the company of many kids. There are always the exception, but they seem to be few and far between. I seem to be in the minority given the fact that I love my two boys, I don't want to try for a girl, and while your kid might be cute I don't feel a biological attachment to them. Maybe growing up in the late 80's/early 90's has just left my generation a little more jaded, for better or for worse I am the way that I am. One thing that always makes me happy is pancakes. I love pancakes, I could eat them three times a day (if it wasn't nutritionally a horrible idea). My kids are pretty much the same way, but they love waffles and pancakes about equally. Since my household is also banana obsessed I make a lot of banana pancakes. The following is a recipe for banana pancakes (they freeze very well!). Sift dry ingredients through a flour sifter (this step isn't necessary, but it really does make for fluffier pancakes). Mash bananas either by using a potato masher, food processor, or blender. 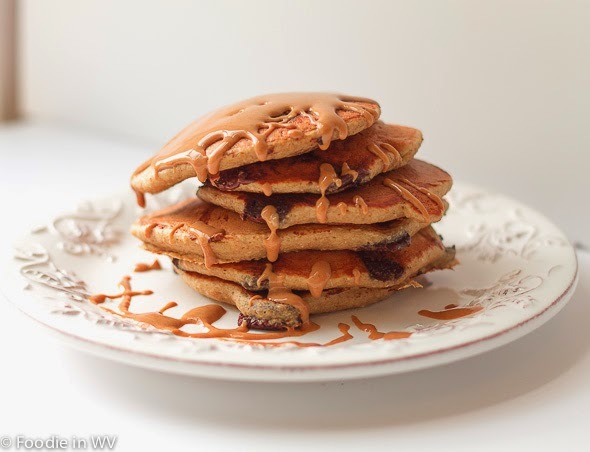 Using the blender or food processor makes for a better consistency throughout the pancakes and reduces the possibility of part of the pancakes staying uncooked. In a separate bowl combine egg, milk, butter and bananas. Don't overmix, the batter will be a little lumpy. Heat either a frying pan on medium heat or a griddle with melted butter or oil. Pour 1/4 cup of the batter for each pancakes onto the griddle. Cook until middle is set and pancake is browned on each side. The melted butter can be substituted for canola or vegetable oil or if you are watching your fats applesauce. I have made this with 1 percent and non-fat milk and either one works fine. Whole or 2% would also work, I have not made it with almond or other non-dairy milks. The sugar could be substituted for honey, agave, or the sweetener you prefer. I have made this gluten free before by making my own oat flour. Making oat flour is very easy, just place whole oats in a food processor and process until finely ground. Homemade oat flour is a great homemade gluten free flour (make sure the oats you are using are gluten free and there are some people with gluten issues that have sensitivities to oats, so be careful if you just found out you have celiac disease etc.). That's it! The pancakes in the photo I added dark chocolate chips and melted peanut butter. Just place peanut butter in the microwave for 20 seconds and it pours easily over pancakes (and it's great with ice cream and other desserts too-yummy!). My twins love them too!! The pancakes sound really good. I always say I'm not a baby person. I loved my babies but that stage was so hard and unenjoyable for me, for the most part. I liked parenting from the toddler stage onward much more. People ask me if I'm having more kids, since I "only" have two. I tell them two is plenty for me! OMG, those sound SO good. Thanks, they really are good! Thanks :) They are really easy too! I'm just the opposite, bring on the babies, lol. I love all kids. 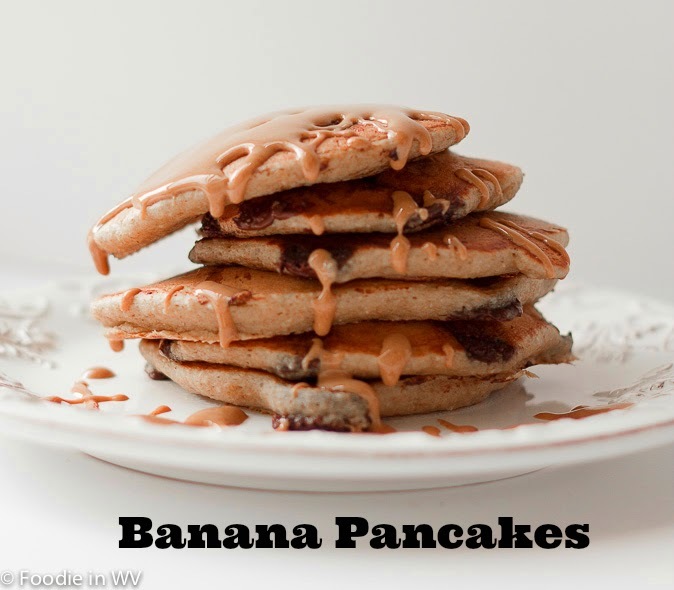 And I love pancakes too, even better w/bananas! I say no to kids at the park too :) My husband is pretty similar to me, maybe even worse. Oh my! I am so doing this tomorrow for breakfast. The good thing about this is I have ALL of the ingredients in my kitchen and we just love pancakes. All kinds! We love pancakes too :) If you try the recipe tell me how it turns out! Those pancakes look so good. Absulately better with bananas. Thanks :) I love adding bananas to recipes, they are yummy! My kids are big pancake fans also, they love them!